From the cold chill to the shorter days, Winter definitely sets its own mood for the holidays. Luckily, Christmas is such a prominent holiday and the décor is so cheerful. With so many wonderful lights garnishing houses, hot cocoa warming hands, and blooms adorning wreaths and tables, the winter chill does not seem so significant. Christmas cheer and beautiful décor can brighten up any wintry home. While lights and trees are great for the holiday, but you can create your own unique décor, such as Christmas centerpieces, that will really impress your guests. Candles and flowers are wonderful Christmas elements for creating a centerpiece that sets a warm and cheerful mood while also adding a fresh floral element to your home. Carolina Carols. 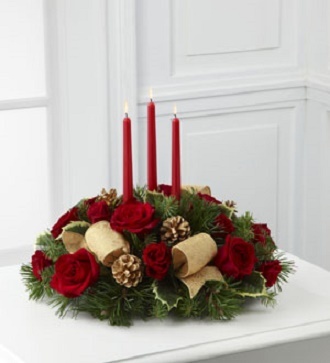 With this beautiful centerpiece, we have taken three gorgeous candles, and surrounded them with a lovely collection of rich, red and green flowers, along with a full collection of evergreen. The flickering light that the candles provide will bounce off the beautiful blooms, providing a warm and welcoming feel to your home. Celebration of the Season Centerpiece. To create this grand, elegant Christmas centerpiece, we assembled the most stunning red roses, accompanied by beautiful spray roses. 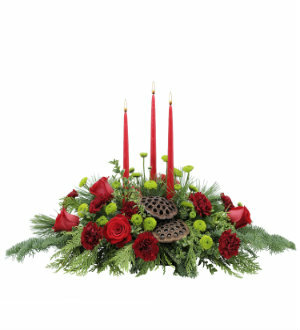 We then brought together these roses and assorted holiday greens, with variegated holly ad encircled them around three, red taper candles, to form a grand Christmas centerpiece that exudes elegance. This is perfect if you are looking for décor that will give your home an element of cultivated beauty. Cinnamon Spice. 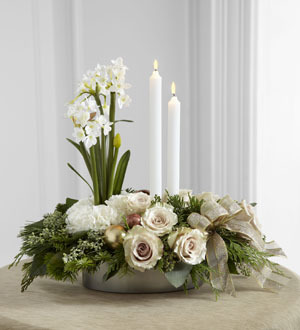 We created a visually powerful centerpiece, featuring two candles, and beautiful flora. We combined rick evergreen with beautiful, textural foliage, perfect for the Christmas season. This isn’t your run of the mill centerpiece, we have created a floral masterpiece with unique foliage that will have your guests staring in awe at just how wonderful it is. 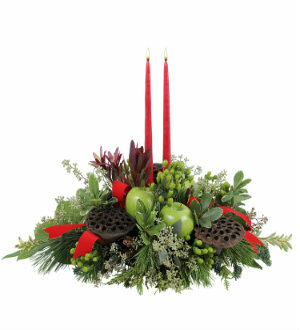 Your home deserves gorgeous Christmas décor, such as an elegant centerpiece featuring flowers and candles. Here at Texas Blooms & Gifts, we offer many elements of Christmas décor that is sure to bring a little holiday cheer to your home. If you are ready to spread the holiday joy, be sure to contact us today. This entry was posted in christmas, flowers, popular holiday flowers and tagged #flowers, Christmas Decor, Texas Blooms. Bookmark the permalink.